Aggie walked to the brow of the hill that overlooked the city. Aggie had never been to the city, but she loved to watch the traffic bustle in and out. Airplanes circled overhead waiting their turn to land, the dull roar of their engines muffled almost to silence by the distance. One day she had watched so long that she had seen the lights come on one by one until it was lit up like a fairy kingdom. Today she arrived at the hill to find an enormous metal man leaning against the edge of the cliff. He was watching the city. With a great grinding and clanging noise the metal man turned to face her. “Who are you?” he demanded in a voice that was so deep that Aggie could feel it in her teeth. “I’m Aggie,” she said, “I live with my mom and dad over there.” She waved her arm vaguely over her shoulder. “What is a robot?” asked Aggie. “From? I am from nowhere. I was built over there from metal and glass.” The giant man pointed into the mountains. Aggie walked to the edge of the hill and looked out over the city. She felt tears forcing their way out of her eyes. The cars and planes blurred. She thought of all those buildings broken and burning; people hurt and crying. The robot bent down further with more clanking. She could smell oil and electricity. The robot shook his head. “Whether born or made, we must do as we are told.” He turned again to look across to the city. The sun glinted on windows and winked from airplanes. A breeze blew the faintest sounds of activity to the hill. Aggie heard the metal grind as the robot nodded his head. Aggie was sure that his footsteps shook the earth, but she couldn’t feel them away up in the air cradled in the metal fist of the robot. “I am listening to them,” said the robot after a while. “They are laughing because some geese are crossing the highway and traffic is stopped.” He walked on. “They have seen us,” he rumbled. “But they won’t attack because they see you. They won’t hurt a little girl even to save themselves.” They arrived at the edge of the city. Police cars and fire trucks were lined up across their path. Planes circled overhead. The whole city watched what happened next. How a little girl stood in front of the colossus with tear streaked face and pushed on the robot”s foot. Miraculously it tottered, then fell backward with a great crash and lay still. Elle Burton:Missing, the second book in the Elle Burton series by Peggy Mound McAloon picks the action from the first book. 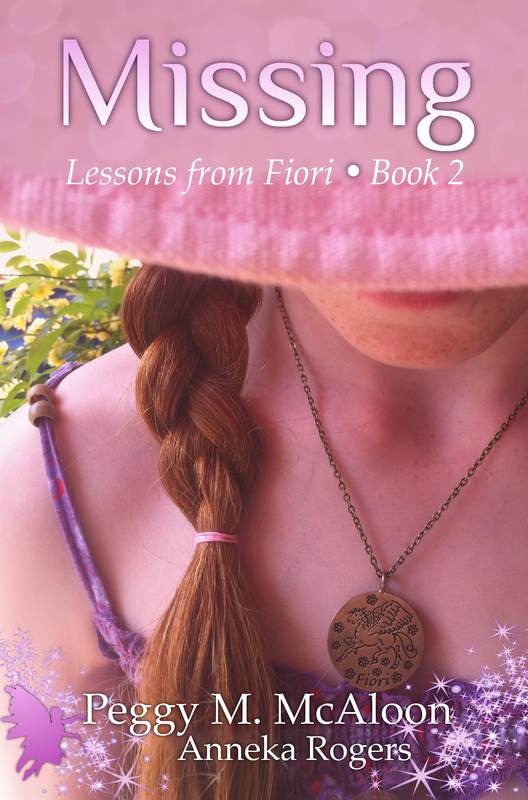 Elle and Jimmy, the reformed bully need to rescue Elle’s brother, all while keeping the Fiori a secret. With strong characterization and a plot line which is about much more than the rescue, this is a terrific book for children as it deals with common issues of childhood without interfering with a rollercoaster of a plot. -Alex McGilvery of celticfrogreviews. Have you ever had to sacrifice something to bring back something or someone you love? Peggy McAloon is here today to talk about the second book in her Lessons from Fiori series, Missing. Elle’s brother has been kidnapped. Will she be able to save him? You will love this Coming of Age, action-packed fantasy for middle-grade readers. Elle Burton’s goal is to rescue her brother. What she discovers is pure evil. The author provides a female role model who strives to overcome her flaws and inspire kids everywhere.